In the beer world, Florida is probably best known for Cigar City Brewing, in Tampa. But that's on the Gulf side of the state. On the east coast, good beer places are few and far between. But I recently visited several brewpubs in the south Florida area and found a few gems. Funky Buddha Lounge and Brewery is in Boca Raton. Funky indeed. Also a shisha and tea bar, Funky Buddha has a very interesting decor. The small brewery creates an every changing line up and many guest taps offer the best of Florida. Funky Buddha was recently named one of the 50 best breweries in the world by RateBeer. Top 50 out of over 13,000 is a pretty impressive accomplishment for the fine folks at Funky Buddha! Cocoa Beach Brewing Company was a nano brewery before nano breweries were all the rage. With the brewery and taproom located in a converted house, Cocoa Beach Brewing Company is quaint. You can't help but meet some fellow beer lovers enjoying Cocoa Beach Brewing's offerings. On the day I visited, they had three beers on tap. I was given a taste of each and I settled on the Pale Ale, which featured a nice Cascade hop flavour, though Nugget and Perle are also used. While that beer was nice and for some reason, I chose it at the time, I regret not ordering the "Not Just Some" Oatmeal Stout. I only had a small taste of it, but I still think about its gentle sweetness and its smooth chocolate flavour. I only had time for one, so I guess I'll have to go back some day for a full pint of "Not Just Some" Oatmeal Stout. Charlie & Jake's Brewery Grille is in Melbourne. They have a few regular beers and a few rotating taps for a total of six house brews on tap at any given time. The highlight, by far, was their Anniversary Ale. Showing a wonderful Cascade-hop character in both its aroma and flavour, and yet balanced against a firm maltiness, Charlie & Jake's Anniversary Ale is fantastic. In fact, comparisons to Anchor Liberty Ale would not be inappropriate. Brewzzi is also in Boca Raton and in a line up of six beers, two stood out as exceptional. The Old English Ale had wonderful malt flavour and a gentle fruitiness accompanied by a touch of gelatine. As the beer warmed, flavours of ripe oranges emerged. And while I don't normally like beers that are nothing more than a light lager with some fruit added, Brewzzi's Tropical Madness Passionfruit had the most authentic tasting passionfruit I've ever had, in any flavoured food of any kind. Normally, passionfruit-flavoured things taste artificial to me, but this tasted like passionfruit. I recently received a copy of Suds County, USA, which documents the explosion in the San Diego craft beer scene. It is an entertaining and thorough tracing of the history of beer in San Diego. Early key players are interviewed and while the documentary focusses on San Diego, beer lovers from around the country and, indeed, the world, will find it interesting to see the struggles experienced during the early days of good beer. Look how far we've come! Highlander Brew Co. is located in South River, Ontario in Canada. They have an obvious Scottish bent to their beers and I was recently able to sample two of them: their Scottish Ale and their Twisted Spruce. 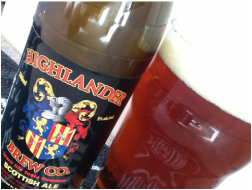 Highlander Scottish Ale has a moderate level of carbonation which provides a touch of dryness to keep the malt focussed flavour in check. The beer is brewed with four varieties of malt and these contribute a touch of coffee, though the finish is then a little astringent. 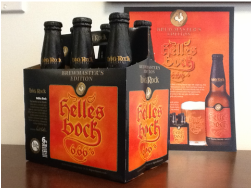 Helles bock is a lighter-coloured version of traditional bock ("helles" is German for "bright"). Big Rock Brewery's interpretation is the latest offering in its Brewmaster's Editions. Of course, "helles" has nothing to do with the afterworld, but I love the hades-themed packaging of Big Rock Helles Bock and the pun (of sorts) of making the beer 6.66% ABV. 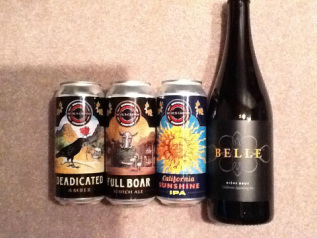 I was recently given these samples of Devil's Canyon Brewery's beers. Although the brewery was established in 2001, I had never tried any of their beers. Devil's Canyon Belle is fermented by Champagne yeast. The aroma and flavour are reminscent of apple juice, though the flavour is quite dry. The yeast contributes a light mustiness that helps to cut some of the apple-like tartness. Devil's Canyon California Sunshine is a rye IPA. It has a solid maltiness with some interesting flavours, though I'm not sure I would have identified them as rye, but for the information on the label. After the initial maltiness, there is a long, lingering hop bitterness that removes any doubt that this is an IPA. Devil's Canyon Deadicated is branded an amber ale, but the label proclaims that this beer defies categorization. It has a flavour that is instantly reminscent of coffee, but this coffee flavour evolves to something more dry, more bitter and more astringent in the finish.